The voluptuous Kentia Palm is best in spacious rooms, or for creating that tropical canopy feel. 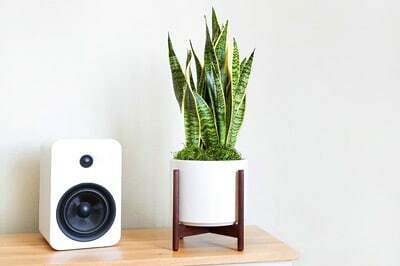 Due to its resiliency, this indoor plant grows at a slow rate and will maintain its overall height and shape with consistent care. Follow the instructions below and you should not have problems with your Kentia Palm. The Kentia Palm thrives in bright indirect light, but do not give it direct sunlight for extended periods of time. It is forgiving in lower levels of light as well, but will grow slower and use less water. Water the soil evenly when the top couple of inches of the soil are dry, but do not oversaturate. Use about 2 cups of water at a time, depending on the exact conditions in your space. The Kentia Palm's soil is very porous and will not hold a lot of water. As with all plants, avoid overwatering, as standing water at the bottom may cause root rot. If it is overwatered, the leaves will develop yellow spots. If it is underwatered (or overfertilized) it will get brown tips. Make sure to wipe the leaves clean of dust once a month. Write us at hello@leonandgeorge.com with any questions about your Kentia Palm not covered here.